I&apos;ve long wondered about the essence of desire, the underlying passion for material things...objects deemed exceptional because of what they are, or what they represent. What is it? The smell, the touch, the sound, the look, what? In a world filled with so many choices, what makes us recognize one in a world of many? When it comes to trawlers, one name has stood the test of time, an icon recognized everywhere by people who love boats. Ask someone to name the best traditionally styled trawler, and the response will be Grand Banks, usually said with a wistful look in the eye. You would have to be a very isolated boating person not to be familiar with American Marine and Grand Banks. Even sailors know and appreciate them-for a stinkpot. During my sailing days I too noticed the mystique, the long lines at the boat shows, the quiet majesty of a well-found Grand Banks motoring slowly by. There is a general acceptance that Grand Banks is the pinnacle of traditional and classic trawlers, one of the best of the best. But what exactly is it that sets this line of boats as a standard by which others are constantly compared? Just what makes a Grand Banks a Grand Banks? I set out to find the answer to this question, and, as it turned out, my quest would take me literally around the world. In the end, I discovered a study of contrasts, the Yin and Yang of American Marine, and two faces of quality. We&apos;ve all heard the Chinese proverb about every journey beginning with a single step. To start this journey, I needed to know where to take that first step. So my journey began not with a step, but a telephone call-to Ed Roberts, Vice President of Grand Banks Yachts in Southport, Connecticut. Soon after, at the Newport Boat Show, Ed introduced me to Terry Ionta, a broker with East Coast Yacht Sales in Yarmouth, Maine. Terry was just completing the sale of a new GB49 to people who represent typical Grand Banks owners. That is to say they are experienced boaters who will use their trawler as a central point for family enjoyment-a grown family that now includes children, grandchildren, and friends. 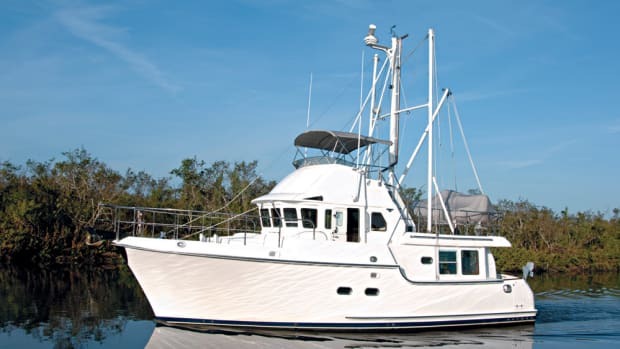 As with many trawler owners, they are lifelong sailors, turning to a trawler when the realities of age set upon them, as well as a need for more room and comfort. Terry is also typical, for a GB broker that is. Experienced on the water and in the engine room, Terry is an avid J-24 sailor, and has done his share of yacht deliveries. Terry was Service Manager at ECYS for six years, managing outfitting and commissioning work on all new boats. He has lots of experience with what works on a boat, and this experience is invaluable when working with buyers in planning a new boat. This particular sale took about two years to close, which is common. Buying a boat like a Grand Banks is not order-taking on the part of the dealer, but rather an interactive process involving lots of discussion and planning between the buyers, the broker/dealer, Grand Banks Yachts, and American Marine. There are many decisions to be made. In interior layout alone, the standard GB49 Classic has four alternative forward stateroom choices, seven saloon arrangements, and five aft cabin layouts. The list of optional equipment, including engines and systems, is indeed a long one. Despite this extensive list of layouts and options, Grand Banks is similar to many of today&apos;s production builders in that customers are also asking for additional custom work. In fact, 80 percent of new Grand Banks are ordered with some level of customization, especially in the larger yachts, although Grand Bank&apos;s George Sass told me such custom work represents only about five percent of the total boat. Even so, when only a few years ago it was normal to prepare a one-page purchase order with maybe eight or ten options, today&apos;s contracts are six pages or more, and include dozens of options and custom changes. "This is a direct result of our commitment to owner requirements," Ed Roberts explained. "Today&apos;s customers are experienced people who have specific needs they want us to accommodate." It is a sign of the times. This requires a good chain of internal communications, which is well-defined at Grand Banks. Brokers and dealers channel all questions and requests for custom quotes through Ed Roberts in Connecticut, or Bob Phillips at the Grand Banks office in Newport Beach, California. Roberts and Phillips then work each issue with the appropriate people back at American Marine. The burden of such single-threaded communications is considerable, but worth the effort. Design changes are kept on file at Grand Banks, which, after thirty-some years of operation, include most everything that can be done to a Grand Banks. This minimizes reengineering costs, not to mention keeping tabs on what people want. The optional alternative layouts all came from past custom work. So it wasn&apos;t hard to understand why Terry already had an inch-thick folder about the new GB49, complete with fabric swatches and furniture sketches, even though the yacht had not yet been started. The construction of GB49 Hull #125 would be the same as all other Grand Banks, no matter what size or model. Each is built to very high standards by one company, American Marine, and the only real difference between them is duration, actual construction time. A near-standard GB49 Classic takes about four months to build. Once the contract is signed, all purchase order information is sent to American Marine in Singapore, where Henry Sim takes the information and, working with the engineering department, compiles the specifications onto a job card for the boat. The job card is the single most important document in the entire process, because it tells the story of how each boat is to be constructed. Every specification and detail regarding this one specific GB49 is contained on this job card, including shipping instructions. The document follows the boat through construction, and is used by engineering, production, purchasing, quality control, and sales departments. Every change and modification is duly noted on it. The job card is sacred at American Marine, on which the success or failure of everything depends. If it&apos;s not on the job card, it never happened or wasn&apos;t ordered. Period. In order to truly follow this story about what defines a Grand Banks, I next had to take a little trip. The answer to my question wasn&apos;t going to be found solely in Southport or Newport Beach. I would have to travel to American Marine, and discover the source of the magic. To Singapore. Stepping off the plane after a thirteen-hour flight from London, I found myself in one of the most marvelous airport complexes ever. It is futuristically modern, a monument to style, convenience, and efficiency. Singapore&apos;s airport was an amazing introduction to a country that is utterly sophisticated, a wonderful blend of modern and traditional. It struck me as a kind of Far Eastern Disney World, with beautiful flowers everywhere, gorgeous architecture, and spotlessly clean. The Republic of Singapore is a thriving global hub for Southeast Asia, even though it is only slightly more than three times the size of Washington, DC. The country has a population of 3.4 million people, mostly Chinese, although official languages include English, Tamil, Malay, as well as Chinese. The current direction of the island country is to develop a substantial national information technology to lead the world in technology. Today&apos;s Singaporean byline is The Intelligent Island. Located one degree north of the equator, the country is warm even in the winter-which explained the lush vegetation, and why I stood melting outside the open building sheds at American Marine&apos;s facility in Jurong Town, Singapore. We&apos;re talking serious humidity. American Marine is located on 16 acres of waterfront property on the south shore of the island, where it has been building Grand Banks since 1968. There are several large buildings, much like warehouses, some open to the weather. American Marine&apos;s yard has a decidedly old world feel, look, and smell. Inside the main office building, I was introduced around by Ed Roberts and George Sass, who had flown over from Connecticut for a scheduled session of the Product Development Committee (PDC), a planning committee of past, present, and future issues. They also gave me a quick orientation tour of the place, after which they went into closed PDC meetings. I soon learned some news that put what I saw in perspective about American Marine and the Intelligent Island. The Singapor e yard&apos;s thirty-year lease is up this year. Due to Singapore&apos;s status as a growing technology hub, labor-intensive industries (such as boat manufacturing) are not high on the political agenda. And young Singaporeans are not choosing to apprentice in the gritty skills of boat building, preferring instead techology careers in modern offices. In anticipation of this, American Marine opened a brand new sister facility in 1995, a short distance away in Johor Bahru, Malaysia. American Marine doesn&apos;t plan to leave Singapore, but with the termination of its lease, the plan is to update and adapt. Singapore will remain home for American Marine, but in a different Singapore facility that is smaller and closer to its Malaysian counterpart. The Malaysian yard currently builds the Grand Banks 36 and GB42 Classic, while the Singapore yard continues to build the GB42 Europa and all of the larger yachts. I left my bags in the office and went for a stroll around this famous, but soon-to-be-history boat yard. One building held the molds for the big GB49/52 hull and deck molds, as well as the monstrous GB58 mold, which sat like a king lion in one corner of the building shed. I also saw the well-worn molds for the GB32, no longer in production. Molds for a Grand Banks hull and deckhouse are large unwieldy things, with cross bracing and thick supports to maintain proper shape. I watched a crew lay up a GB46 hull, giving life to a new Grand Banks trawler. They were positioning resin-rich fiberglass cloth in the transom area, the boat still some time away from completion. After a curing period, each new hull is removed from its two-piece mold, and any blemishes are immediately corrected. Then the hull is moved to a special building where the stem is ground smooth (due to the two-piece hull mold, the stem often resembles the edges of a waffle that comes out of a waffle iron), the corners and window openings are trimmed, and all rough edges taken out. This is nasty work, and the men doing it are in air-conditioned body suits in a closed space to mimimize health or envionmental damage. When the hull and deck are scheduled for assembly, these massive pieces are wheeled onto the production floor. At the opposite end of the yard is another set of buildings which house the woodroom, varnish shop, and a nicely-stocked storeroom. The famous Grand Banks moldings and woods are milled onsite, and the smell of teak is quite intoxicating. Carpenters and their tools fill the adjoining carpentry shop. These craftsmen produce a steady flow of beautiful teak furniture that is stacked and lined up, one piece as exquisite as the next. I saw folding teak tables, sanded but not yet varnished. Teak window frames hung in quantity like rectangular hula hoops, waiting their turn in the assembly process. In all I saw a dozen or so carpenter stations, each arranged so the men could share common power tools. Carpenters worked alone at their stations, and, as I watched, the sound of table saws filled the air, accompanied by contemporary Singaporean music coming from a radio located so everyone or no one can listen. Adjacent to the carpenters is an area where each piece of furniture is sanded to a smooth finish and varnished, and sanded, and varnished... over and over. The schedule for interior varnish is four coats of gloss with a top coat of satin finish. Not one inch of furniture is left untouched, even if it will eventually be hidden from view after installation. All furniture is sealed, varnished, or painted. The quality of GB&apos;s finished teak furniture is fabulous. I learned that once a job card is created for a new boat, and a slot allocated in the schedule, many concurrent projects begin. It is not uncommon for furniture to be fabricated well in advance of hull and deck. Passing through the varnish shop, I moved onto the football field-sized floor area of the production floor. There were men and projects going on all across this massive concrete floor, everyone on some mission, driving ahead the assembly of Grand Banks trawlers. Off by himself, one man was busy building teak grates. Grates, grates, and more grates. Gaggles of grates. Gobs of grates. Pallets of grates, grates of every shape and size. I never realized just how many teak grates go aboard a Grand Banks. Every time I passed by this fellow, the pile of grates continued to stack up, even though grates were being removed from this pile and installed in the boats on the floor. The grates were as pretty as the furniture. What can I say-he did grate work! Each of the production workers wore either a light blue or tan Grand Banks T-shirt. Supervisors wore collared sport shirts, so it was easy to spot them as they moved from work team to individual worker, checking progress, offering suggestions, answering questions, all the time ensuring steady progress. I spoke with Derik Lye, Senior Production Manager at the Singapore yard. He&apos;s been with American Marine for fourteen years. I asked him for his perspective on what makes a Grand Banks a Grand Banks. "The traditional profile has something to do with it. The proportions are right, which is why a Grand Banks just looks better than other boats. It is a style thing," Derik told me. But it&apos;s not limitied to styling. "We have a lot of handwork in these boats. It is very expensive to build a boat this way, with teak floors and all, and the result is a traditional boat that people want. All of the handwork makes a difference." And I got a glimmer of Answer, Part 1. Enthusiastic managers like Derik Lye are the thread that holds the assembly, manufacturing, quality control and development teams together. They keep everything running on schedule, integrating current tasks with the next, anticipating and solving problems so the different departments are not left waiting for each other. "Every day I walk around the yard, and check the status of everything in the various areas. I go around and ask people how things are going, what problems they are having, and how much work is complete. "A lot of the problems in boat building are sequential, leaving people without things to do," Lye explained. It is quite a juggling act. In Singapore, the workers are older, and tremendously experienced in their jobs. The average length of service at American Marine in Singapore is eighteen years, and 58 percent of the workers on the production floor have over fifteen years with the company. Loyalty is extremely high, which alone speaks volumes. I stood off to one side of the deck mold of a new GB52 Europa, and watched a solitary worker lay a teak deck. Patiently and methodically, he set a strip of teak next to the one alongside, totally focused on the job at hand. Blocking out the noise of the surrounding activity, he concentrated on what he was doing, working constantly and without mistakes. He alternated between two air-driven tools, one to drill a measured hole through the teak and fiberglass deck, the other a power screwdriver to fasten the teak to the deck, while his foot held the teak strip against a wood spacer to ensure its proper alignment along the deck. Once he finished screwing down the teak, he moved aft a short distance, pulling his tools with him, where he started the process over. Behind him teak strips lay in a pile, each numbered, already properly trimmed and sized. When I looked back at this fellow later, his progress (slow and steady as it was) was quite noticeable. Another time I walked around the interior of a new GB52 Europa being finished with hull and deckhouse already married. There must have been fifteen men working in the confined spaces of this boat, tools and parts everywhere in the incomplete boat. It was a total mess. Some of the men worked in small groups, others fluttered around inside the boat doing God knows what. And everyone made lots of noise. Amid this chaos, a solitary electrician sat facing what would be the lower helm station. He sat surrounded by bundles and coils of wires and thick cables-remember the snake pit scene in the Indiana Jones movie? An ancient wood tool box by his side, the electrician blocked out the noisy madness around him, and methodically ran wires and cables into a distribution panel that would be critical to the safe operation of the boat. He carefully and expertly labeled wire ends and made electrical connections, all the while tuning out the noise and commotion as others worked around him, sometimes even passing tools and parts over his head. At the same time he constantly fended off the thick wires that kept trying to recoil and entrap him. And the poor fellow didn&apos;t even have Indy&apos;s bullwhip! Later, when I looked back at this interior station, I found every wire nicely finished and tied, the result of obvious expertise. It was a wiring job you would expect to see in a NASA spacecraft. Figuring out wiring is hard enough when you are working alone-imagine doing it in the midst of a rowdy New Year&apos;s Party!?! Each yacht interior is built as several complete structures, known as modules, on the production floor before going into the hull. Pieces of interior furniture, such as an island berth, are finished to about 95 percent complete in the carpentry shop, then taken onto the production floor where they are attached to teak-soled floor module sections. Bulkheads are then installed, as are stairs and other furniture components. Each completed module is later trimmed, all edges and underneath surfaces sealed, epoxied or painted, and wires run for lighting, bow thruster control cables, and electrical outlets. A completed module structure is lowered into the hull as a unit. It is much easier to build a production interior this way, especially hard to reach sections, and there aren&apos;t little piles of sawdust in the bilges. There are also no rough or unfinished edges behind corners, where tools and hands just can&apos;t reach when an interior is built in the boat. Another benefit is that installing machinery can lead to damaging dings (or worse) to the boat&apos;s interior furniture, so American Marine installs engines, tanks, and other major equipment in the hull before finished interior modules slip into place. When I first arrived at American Marine, the large production floor was filled with bare hulls, deckhouses being finished, cabin and saloon soles on which furniture was being attached, almost-complete interior modules with wiring harnesses neatly threaded through bulkheads and furniture, pallets of engines waiting for installation, and of course, The Grate Man. Over the course of a week, the scene imploded, as furniture became modules, engines and modules were installed in the hulls, and deckhouses held over top for fit and trim. Initially, everyone worked by himself or in small groups spread out over the thousands of square feet of floor real estate, but all activity slowly centralized into the areas immediately surrounding seven yachts. Y.P. Wong is Chief Operation Officer at American Marine. He knows everything about Grand Banks. When asked the question of what makes a GB, he thought for a moment, then summed up what I&apos;d heard from others around the yard. "Firstly, the design is that of a conventional style boat. Then, the workmanship in the boat and interior is outstanding, and so it stands up well against other boats. "We have a mission statement in the PDC that we will continue to build conventional style boats to the highest quality." At the completion of each project, no matter how big or small, the work is checked and signed off by a Quality Control person. If you casually pick up even a small piece of boat hardware, such as a deck cleat waiting for installation, you will find a little sticker with an American Marine label title "QC Passed" with the date and initials of the person who checked it. That level of attention and personal accountability is very, very good. Answer, Part 2. Throughout my time in Singapore, I saw traditional building skills: slow, steady, and everything handmade. There were no fast assembly line robotics or super high-tech magic. And that is intentional. Bernard Sim, Senior Shipping Officer in American Marine&apos;s Planning & Shipping Department, was quite articulate in answering my question. "What makes a Grand Banks a Grand Banks is the quality craftsmanship that goes into each boat. This is something that just can&apos;t be put in by an automated process. "Boat building is somewhat unique because it really doesn&apos;t lend itself to automation, and to find quicker, less labor-intensive methods of building the boat would result in it not being a Grand Banks." Later, an image formed in my mind while I absorbed the sights and sounds at American Marine in Singapore. I believe it makes a good analogy. And it is Answer, Part 3. The reputation around the world of Grand Banks is that of a classic, traditional trawler that is high class in every way, made by hand with time-honored craftsmanship. In the automobile world, what would be its equivalent? I suggest Grand Banks compares to Rolls Royce, rather than, say, a Mercedes Benz, or BMW. The Teutonic companies are also very high quality, but are much more progressive in advanced technology, as well as continuing to define the contemporary form-follows-function art form. Rolls Royce, on the other hand, is a hallmark of old world craftsmanship and timeless, classic style. Like the Grand Banks, a Rolls makes a decidedly conservative statement, of expensive hand construction and solid design, rather than high technology solutions and next-century promises. If Britain&apos;s Royal Family had a trawler, I bet it would be a Grand Banks. To the owner&apos;s of GB42E-1390, 46E-202, 42E- 1389, 42E-1388, 52E-008, 52E-007, and 52E- 006-congratulations, your boats look beautiful. It was now time for a major change of tempo-a visit to the Malaysian Grand Banks yard in Johor Bahru. It was to be a completely different experience from Singapore. As refined and sophisticated as Singapore is today, Johor Bahru is the opposite, teeming with development and transition. New office complexes sit next to shacks with corrugated roofs. Motorbikes blast around in a constant chain saw whine of two-stroke smoke. The small cars are mostly a locally-built automobile called a Proton, yet every tenth car is a shiny new Mercedes Benz. Malaysia has the look and feel of a developing country, a land on the move. The Pasir Gudang address of Grand Banks Yachts puts the new yard just off the Johore Strait across from Singapore&apos;s north coast. The facility was built from the ground up in 1995, with 100,000 square feet of floor space available on eleven acres. Everything about the place is new, from buildings, to molds, to workers. Even the management. American Bruce Livingston used to be general manager for Little Harbor Yachts in Taiwan. A graduate of Johns Hopkins University in Baltimore, MD, with a Masters Degree from the University of London, Bruce didn&apos;t ascend through the ranks of a boat yard. He is a trained engineer and businessman. Fluent in Chinese, he can converse simultaneously with Singaporeans, Malaysians, and Americans. That&apos;s a good thing, because everyone at Grand Banks Malaysia works for him, and he knows everyone&apos;s job intimately. This man really knows how to build boats. Where American Marine in Singapore has an experienced, older work force, the Malaysian plant is filled with youth, young people learning the nuances of quality boat construction. The energy of youth is everywhere, including loud American rock music. I mentioned that to Bruce. "Every boat building crew needs to be listening to rock music," Livingston responded with a laugh. "You just can&apos;t build boats right if you&apos;re not listening to loud music." As much as the individual counts in Singapore, here it is the team. Small teams work on the production floor, and supervision is everywhere. When I visited the yard, there were five supervisors and twelve foremen overseeing production at GB Malaysia. I quickly learned that the modern approach to building Grand Banks in Malaysia is more mental than anything else. Take the carpentery shop. Bruce told me his workers don&apos;t just knock out tables and other wood products. "We build what we call boat sets, that is, the parts required for building a specific boat on the line. If you see three sets of doors, for example, it is because we have three boats under various stages of construction that will use those doors," Bruce explained. He added that, "If a guy feels like making window frames one week, he doesn&apos;t go off and build as many as he feels like, in the hope that we will someday use them. It just doesn&apos;t work that way. We only produce what we need right now." The workers in Malaysia still build the boats by hand, but there is much more automation of the management of the process. Given the aging of the Singapore craftsmen, who will one day be as scarse as quality teak, I knew I was looking at the future of Grand Banks. If you buy my analogy with Rolls Royce, GB Malaysia is where the Rolls Turbo Sport Coupe would be built. I stood on the upper platform looking down on the line of GB36 and GB42 boats slowly coming together. Loud country western music mixed with the sounds of boat building, the strong smell of teak and fiberglass heavy in the humid air. The energy of the workers mirrored the focus of Singapore, but the pace was faster, more charged. In addition to this youthful spirit, I also noticed many young women on the Malaysian teams-making fiberglass parts, sanding helm wheels, running wires, and doing much the same work as the men. Bruce has introduced some modern improvements onto the production floor in Malaysia. For example, I saw workers vacuum bagging an Eastbay 38 cabin sole while others watched to learn how to do it properly. Livingston would like to have more fiberglass work done this way, as it ensures the best possible bond. Since the boats here are smaller than those in Singapore, they come together faster, and there is less custom work to design, engineer, and construct. That equation seems to fit the spirit of the yard, and future plans will no doubt capitalize on that energy. Maybe it&apos;s the rock music. In both Singapore and Malaysia, all completed boats undergo sea trials to check each boat and its systems. I witnessed Quality Control people, clipboards in hand, swarming all over a new yacht, making sure the new trawler was up to snuff...that it was a Grand Banks. At the completion of sea trials, each boat is hauled out for final detailing, and yet another round of checklist activity. When everyone is finally happy, which is to say Quality Control is satisfied, some of the boat&apos;s extremities are disassembled and the boat is prepared for shipping. I noticed a high level of attention to detail present right up to the final touch of a worker&apos;s hand, the boat sent off to her new home. The receiving Grand Banks dealer gets a fully operational trawler that needs a minimum of reassembly, apart from dealer-installed equipment. When the new owners take delivery of their new Grand Banks, they can be assured their trawler has been through numerous checkpoints to ensure rigid quality standards. Even the dealer must complete a formal checklist of items for warranty by Grand Banks and American Marine. There are few holes in the process of buildinga Grand Banks. I spoke about the old and new with Bob Livingston (no relation to Bruce), President of American Marine. What is the future? Current plans are to open a new Singapore facility on the NE coast in Loyang, at the base of Serangoon Harbour. The Loyang yard will be much smaller, only 35,000 square feet as compared to the 100,000 in Pasir Gudang. All hull and deck molding will move to Malaysia, and Loyang will be dedicated to finishing the GB49 and larger, more custom, trawlers. Loyang will open in May, 1999. Ultimately the two plants will work as one. The larger yard will build parts for both, and the process flow will be the same. The coming together of older experience and craftsmanship with youth and technology, will result in modern, yet still classic Grand Banks. The two faces of Quality. The Yin and Yang of American Marine. Bob Livingston was expecting my question. And he had his answer. "It has a solid image: a consistent, conservative, instantly-recognizable sheer; the profile and clear lines; the almost plumb bow; that certain angle of windshield; the joint between the deckhouse and flybridge-these are things that are instantly-recognizable from 500 yards away. A Grand Banks look like a Grand Banks, always has. The Grand Banks look is unique." He went on. "Building a GB is exciting. I don&apos;t think there is any company, in any industry, that has better customers. Not one. And every one of these customers has a story to tell." When I left Southeast Asia it seemed that I had found several answers to my question. The enthusiasm of the management. The commitment and dedication of the workers, young and old. An evolving mission to build the highest quality, traditional style trawler yacht with handbuilt craftsmanship. A proven seaworthy design. There has been quite a heritage built up over the years in Singapore and now Malaysia, and the future of Grand Banks is all about staying faithful to that chosen path. There&apos;s karma, just like Rolls Royce. A Grand Banks is not the right boat if you want a contemporary, full displacement ocean motorboat, but it certainly fits the needs of the vast majority of us who don&apos;t intend to cross oceans-and that is the path of Grand Banks. You don&apos;t take a Rolls Royce off roading, either. 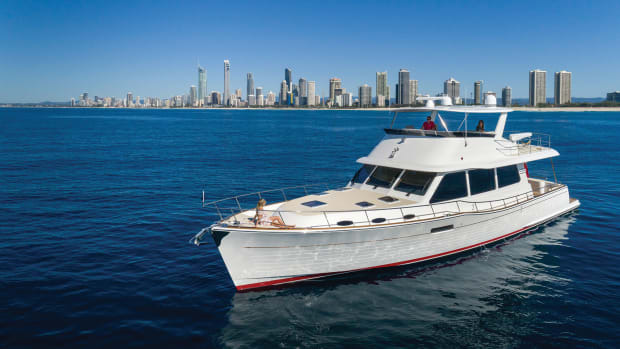 No matter how long you look, you are not likely to find a better built boat, or a more classic interpretation of the original trawler yacht than the Grand Banks from American Marine. But I had one more person to whom I wanted to ask my question. He was up in Maine. I called Terry Ionta in Yarmouth, and popped the question to the man who had begun this journey with me. He was still months away from delivering GB49-125, but his file remained thick with notes and diagrams. Terry had once told me that he likes to build boats that he would love to own himself. That told me something about the man. Terry was in a meeting and would have to call me right back. When he did, I asked him what he thought made a GB. He spent a moment thinking, typically Maine. "Well, it seems to me that what makes a Grand Banks a Grand Banks is the lifestyle. The boats are special, as are the people. They enjoy each other, and there is a feeling of comraderie among the owners. I think what&apos;s special about Grand Banks is the lifestyle people enjoy on them." I don&apos;t think he could have said it better. It is, perhaps, the final element to a question that took me far and wide, looking for one answer where I found several. These answers fit together like pieces of a puzzle. There is clarity. My wondering is over and now I know what makes a Grand Banks a Grand Banks. If the boat named Spray were to motor slowly through an anchorage today it would turn heads in admiration and generate at least a million inquries: What is it? Who built it? That straight stem and the beautiful sheer line would seem familiar to some. Others would find a teasing hint in the shape of the forward trunk cabin, with its teak trim and grab rails. The boxy saloon, with workboat windows, wouldn&apos;t quite fit the mental picture of a yacht some observers would be forming. But then its perfect wood construction, the wire lifelines and stout stanchions, and the big cockpit would ring bells. What the heck is it? It&apos;s a Grand Banks-and it isn&apos;t.
In 1962, Robert J. Newton and his sons, John and Whit, were running a custom boatyard on Junk Bay in Hong Kong called American Marine, Ltd. Father and sons built heavy sailboats and big motor yachts, to designs by the world&apos;s top marine architects-Sparkman & Stephens, William Garden, Nat Herreshoff, Ray Hunt and others. That year they commissioned Kenneth Smith, another well-known marine architect, to design a 36-foot, diesel-powered cruising boat. Spray was launched in 1963 and a year later the Newtons abandoned their custom yacht building to focus on producing the first of a line of boats that would be known as Grand Banks. Even before Spray, however, there was the Chantyman that American Marine built of wood in its Hong Kong yard. Diesel-powered, the 34&apos; 6" boat had a raised pilothouse, high bulwarks and softer hull lines (no hard chines). It was unlike Spray or the 36GBs that would follow, but Chantyman certainly was a design that introduced the concept of a production trawlertype yacht to the boating world. A few of the Chantyman line are still cruising, and every time one shows up at a Grand Banks rendezvous, everyone again asks, "What the heck is that?" Spray was the prototype of the line that would succeed. With some changes, such as a larger saloon and the addition of a flying bridge, its successor became the craft that sold the world&apos;s boaters on a finely built, eightknot trawler (although today&apos;s GBs may be fitted with engines that make them run much, much faster). The general styling of the GB was seized by a score of other builders for fleets of look-alike yachts sold under dozens of names, but which could not match the quality of construction for which American Marine was famed. The GB36 is not being built this year, partly because of market demand for larger boats, which yield better profits. But American Marine says GB36 production will resume in 1999 and that the company is considering several improvements to the classic yacht, as well as "production steps" that will make it more profitable. The 32GB, of which 861 were built, is out of production for similar reasons. Don&apos;t expect it to come back, however. American Marine continues to produce yachts from 38&apos; to 66&apos; in the GB and Eastbay lines, and its production line is sold out well into 1999. The company said it will build 88 GBs and Eastbays annually through 2000. Although Grand Banks yachts have maintained the same classic hull design from the beginning, variety has also been an important part of the history of American Marine. In 1971, American Marine designed and built a hot and luxurious express cruiser called the Laguna that was a harbinger of the less-teak-isbetter movement. There were two models, a 10 meter (33&apos;) and an 11.5 meter (a 38&apos; speedster priced at $72,000 in 1972). Both were powered by turbocharged V8 diesels (each with a fiberglass sound shield) that gave them a cruise speed of about 24 knots and a full-throttle rush to 30. The design may have been too radical for the market, as some believe. But its early demise after good sales for several years (171 boats) probably came more from potential buyers&apos; fear that they couldn&apos;t find or afford diesel fuel for the thirsty engines. After all, they were introduced about the time an oil embargo sharply reduced the flow of gasoline and other fuels to the U.S., leaving motorists in gas station lines that were blocks long and sending pump prices soaring beyond belief. As the economy staggered and interest rates reached into double digits, business expansion faltered and Laguna production ceased. Simultaneously, however, the world&apos;s trawler builders, including American Marine, were praising the fuel economy of a low horsepower, singleengine boat that could run a season on a tank of diesel fuel. The Laguna died, while the trawlers kept chugging along, powered by thrifty Ford Lehman, Perkins, GM and John Deere diesels. American Marine would later revive the express boat in 1993 with introduction of the 38&apos; Eastbay, a fast Ray Hunt-designed yacht powered with a pair of powerful Cat diesels. Once again, other builders copied success and introduced similar express cruisers to the boating market. Fuel supply or cost don&apos;t concern go-fast boaters. The company was growing quickly, too quickly perhaps, in the early 1970s. It owned part or all of 33 dealerships worldwide and was involved in a number of business alliances, including a joint venture to produce a marine version of the John Deere diesel, the AmMarine. As the boating industry crumpled under the weight of soaring fuel prices and double- digit interest rates, American Marine was soon facing bankruptcy. In 1975, control passed to a group of investors headed by Bob Livingston, who continues as chairman today. American Marine is traded on the Singapore market under the name of Grand Banks Holdings, Ltd. It is difficult for U.S. residents to buy stock in the company, but some banks and brokerages will accept orders for stock on the Singapore exchange. And, by the way, Spray continues to cruise today. She&apos;s on the Great Lakes now and every time she motors into a moorage someone probably asks, "What the heck is that?"